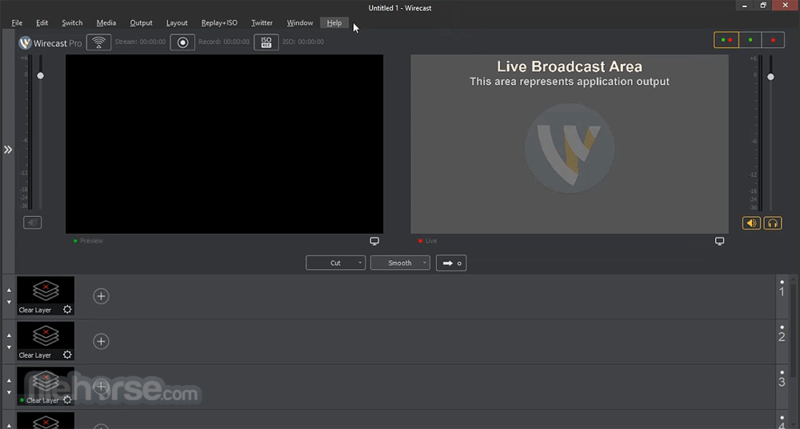 Turn your laptop or computer into a television studio with Wirecast, the most popular award-winning video production software for Windows. Perfect for live streams, webinars, webcasts, sports, church services, and education or training videos, and more. Learn more below, or try it for free. Easily stream and produce professional video! Engage and expand your remote congregation with live streams of your services and events. Reach out and touch more people. Live stream graduations, award ceremonies, student news and sports, guest lectures, and classroom lessons to your community. Wirecast is used at every level of education. Capture the action! Use Wirecast’s professional features like clocks, scoreboards and instant Replay to bring your audience to the game. Live stream conferences, concerts, interviews and more. It provides everything you need to stream professional live events. Stream your programming to OTT and social platforms or augment your premium content with second-screen live and interactive offerings. Wirecast for Windows is the perfect live video marketing tool. Engage real-time with customers, fans and prospects using Wirecast’s native integrations with Facebook Live, Twitter, Periscope, YouTube and more. There’s a reason Wirecast is used by hundreds of thousands of people around the world for live streaming, recording, and video production. It committed making each version better than the one before it. It continually release new features, fixes and improvements at a rapid rate. The latest version features an integrated Stock Media Library (included with every active support subscription. ), Stinger (Custom Transitions) Playback Speed Controls, Rendezvous Audio Mixing and a QR Code Generator. Turn any iPhone (4S or newer) or iPad into a wireless camera and capture into Wire cast as a source using Wirecast Cam. Sync any audio and video sources using advanced video and audio delay features! Great for productions with multiple types of sources. Switch any sources you’ve captured in real time for your audience and produce your show. Add professional transitions and smooth fades between sources. Assign any audio input source to any and all video sources or vice versa. Dynamic editing of any and all sources. Resize, position, crop, flip rotate, add color correction filters and more. Use Wirecast’s powerful graphic editing features to compose picture-in-picture shots or layer up to 250 different sources on screen at the same time! Easily add titles and lower thirds, scrolling, crawling or live text to your broadcast. Choose from our template library of pre-made titles, and or bring in professional animated 3D live titles, scoreboards, clocks, logos and more using NewBlueFX’s Titler Live Express software (a $99 value), included with every purchase of the program. Built-in audio mixer allows for better control over any audio source. Mix-minus, panning, solo, mute and audio playout device selection are some of the powerful new audio features. Want to capture individual high-quality, edit-ready files for each camera you’re capturing? ISO Record feature will allow you to specify which sources you want to record separately. Use built in scoreboard generator (Pro), or create your own using NewBlue’s Titler Live Advance ($445) or Titler Live Ultimate ($945) — available for Wirecast Studio or Pro. Bring in real-time data directly from your stadium scoreboard using Sportzcast’s technology, for hands-free scoring! Choose from over 30 integrated destinations, or add your own custom RTMP destinations. Stream your content to Facebook Live, YouTube Live, Twitch, Microsoft Azure, DaCast, Churchstreaming.tv, Wowza, New! Hitbox and many more! Streaming to them is as easy as entering your username and password in Wire cast and getting automatically connected with your account. Note: Watermark on the broadcasted images. Limited functionality in demo version.